The butterfly filigree connectors are Vintaj and the beautiful focal beads are Czech glass that I bought from LB. Triple strands are interesting and enjoyable to make. This is gorgeous! Oh, wow! 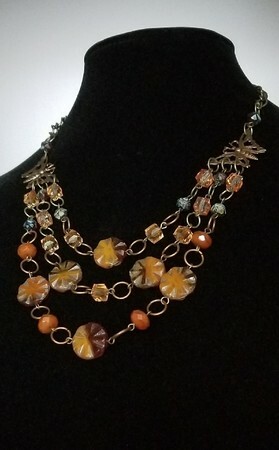 Always love multi strand necklaces but they can be challenging in the balance and drape, ( at least for me) I’ve always loved those yummy Czech flower discs but never bought or tried them. Your design with the butterfly links and jump rings is beautifully done. Great design, love the color! I agree that these triple strands can be tricky to balance and lay just right. You’ve done a wonderful job! The butterfly links make this really special.